Sam Edwards, "In the Last Days of the Empire." Sam Edwards, I'm told, was a bartender at "55," the joint next door to the Lion's Head. I seldom went into 55; whenever I did my nostrils were assailed by the smell of insecticide. There was good jazz there, but in those days I'd yet to develop an ear for it. My few visits were occasioned by hearing that someone I liked who'd been 86'd from the Head (which, despite its raffish reputation, maintained fairly strict standards of decorum) was having a drink there. 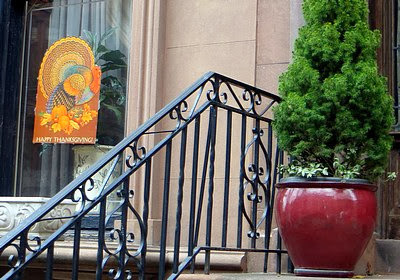 It was owned by Bradley Cunnigham, who also owned Bradley's, an upscale bar and restaurant on University Place where my appreciation for jazz got a jolt one evening from listening to Joanne Brackeen. I heard that Bradley made more money off 55 than from Bradley's. Bradley's, like the Lion's Head, is long gone, but 55 survives. 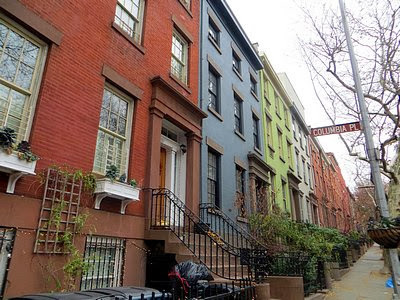 Sam's video and poem, for which I must again offer thanks to Michael Simmons, is about Greenwich Village before I arrived; the Village of my high school and college aspirations that I, and others like me, unwittingly helped to destroy. Like Michael, I was delighted to see, in one of the photos in the montage that accompanies the reading of the poem, a poster for a concert by David Amram. e.e. cummings, "i thank you God," by The Western Wind. I posted this e.e. cummings poem two years ago on Easter. Yesterday I found this version set to music by Elliot Z. Levine, a member of the a cappella choral group The Western Wind. The poem and song seems appropriate for today. Happy Thanksgiving to all. 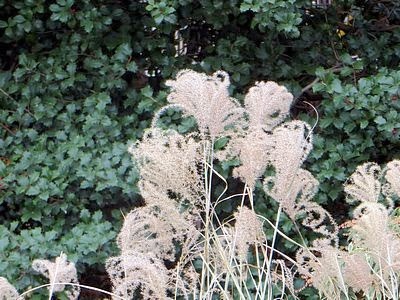 iPod and photo log from a short walk around Brooklyn Heights and Brooklyn Bridge Park. 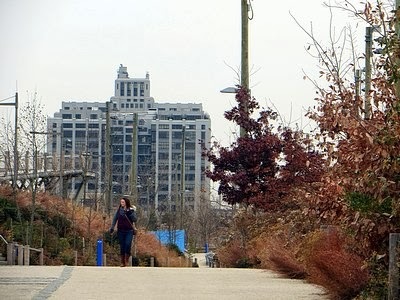 Yesterday morning I took a walk down the Brooklyn Heights Promenade, across the pedestrian bridge to Pier 1 in Brooklyn Bridge Park, around the pier, and then along the new path through the Pier 3 and 4 uplands to Pier 5. I did a circuit of Pier 5, then went up Joralemon Street to Hicks, across Hicks to Remsen, over to Montague Terrace (former address of W.H. Auden and Thomas Wolfe), then home. On my walk I had my iPod set on shuffle, and made a log of the music I heard on the way. As each song played, I took a photo of what I was passing. I've listed the songs, with video or audio links where available, below each photo. 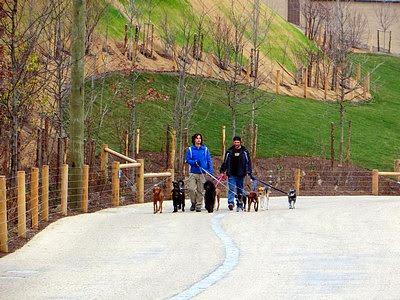 I've let the photos speak for themselves, except for some explanatory notes at the end of the post. 1. Martin & Neil, "Baby": Vince Martin's and Fred Neil's only album together, Tear Down the Walls, was released in 1964. My college roommate had a copy; I loved it and got my own. 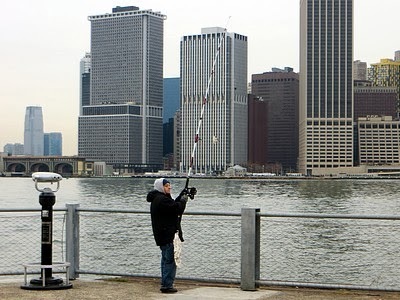 Years later, I met Vince at the old Lone Star Cafe on Fifth Avenue. I told him I how I liked that album: he asked if I wanted to sing a song from it. He borrowed Rick Danko's guitar and we sang "Dade County Jail", with me trying to reach Freddy's low notes. "Baby" is Florida blues at its best, about "sailin' on that St. John's River", with raga-style strumming on the twelve string guitar and John Sebastian on harp. You can hear it here. 2. Neil Young & Crazy Horse, "Cowgirl in the Sand": This has been a favorite of mine since I got their first album, Everybody Knows This is Nowhere, during my last year of law school. The version on my iPod is from Live at the Fillmore East, March 6 & 7, 1970. Video of another live performance here. 3. Rod Stewart, "Reason to Believe": Rod the Mod takes a Tim Hardin song and makes it a gut-wrenching masterpiece. It's from Every Picture Tells a Story, one of the best rock albums ever. Live performance video here. 4. Fleetwood Mac, "Station Man": a driving rocker from Kiln House (1970), the band's first post Peter Green album and the last to feature Jeremy Spencer, and with cover art by Christine McVie. Hear it here. 5. 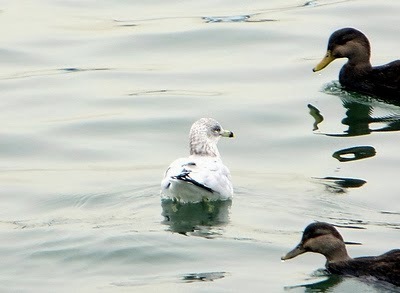 The Byrds, "The Times They Are a Changing": jangling Rickenbacker guitars and vocal harmonies make this Dylan song a rock anthem. My generation were "your sons and your daughters" then. Live performance video here. 6. Yvonne Fair & the James Brown Band: "I Found You": From Roots of a Revolution, a chronicle of James Brown's early days with King Records, based in Cincinnati. The Ambassador of Soul later took this song and made it a hit under the title "I Feel Good." Hear the early version, with Ms. Fair, here. 7. The Flying Burrito Brothers, "Do Right Woman": Gram Parsons' and Chris Hillman's post-Byrds group did this Chips Moman/Dan Penn song, a favorite of my mom's, on their first album, The Gilded Palace of Sin. Hear it here. 8. Sue Foley, "Shake That Thing": uptempo blues by a Canadian singer I like a lot, and not just because she shares my wife's surname. Listen here. 9. Dolly Lyon, "Palm of Your Hand": solid R&B from 1957 by a singer who, not for lack of talent, never made it big. There's excellent instrumental backing, including what I'm pretty sure is Willis "Gator Tail" Jackson on sax. Read about the singer and hear the song here. 10. Bunny Berigan, "I Can't Get Started With You": one of my favorites from the Bells of Hell jukebox. Hear it here. 11. Bob Dylan, "Gospel Plow": from his first, eponymous album, a frenetic blues and one of his earlier original compositions. Hear it here. 12. Turner & Kirwan of Wexford, "Second Chance": T&K were the house band at the Bells of Hell for a year or so. Pierce Turner has since become a successful solo artist while Larry went on to front the soon to disband Black 47 and to be a playwright and novelist. There's no video or audio link to this song, but there's one video, with less than optimal sound quality, of them doing "Freeborn Man of the Traveling People". 13. Bob Wills and his Texas Playboys, "Stay All Night (Stay a Little Longer)": the King of Western Swing and his band got together in 1974 to make an album titled For the Last Time, which includes this lively number. Live performance video here. 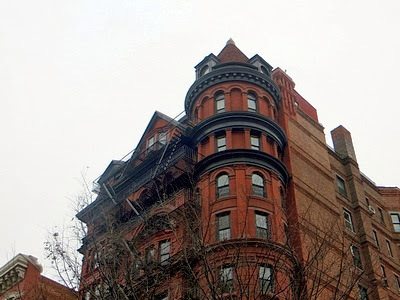 For architecture and theater buffs, photo 1 is of the Arlington Apartments (Montrose Morris, 1887), 62 Montague Street, a fine example of the Romanesque revival style, and home of playwright Arthur Miller before he married Marilyn Monroe. 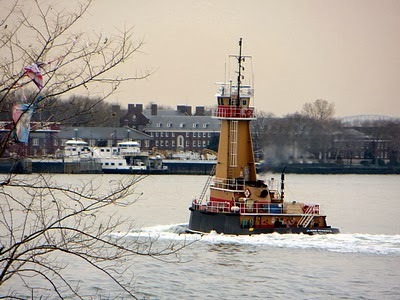 For tugboat buffs, photo 3 is of JoAnne Reinauer III heading out of the East River toward the Buttermilk Channel, with Governors Island in the background. 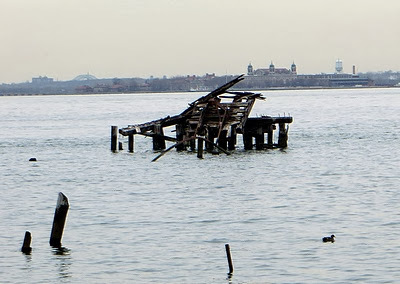 For picturesque ruin and rail buffs, photo 7 is of the collapsed outer end of Pier 4, formerly a rail car float terminal at which freight cars were loaded onto, and unloaded from, barges that ferried them between the railheads in New Jersey and the docks below Brooklyn Heights. 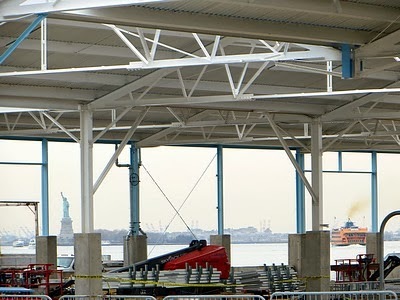 The remains of Pier 4 are being made into a sanctuary for birds and marine life. 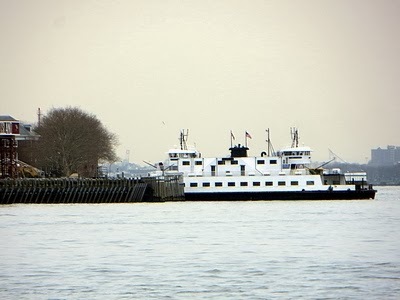 For ferry buffs, photo 10 is of the ferry that runs between the lower tip of Manhattan and Governors Island, seen at its Governors Island dock. 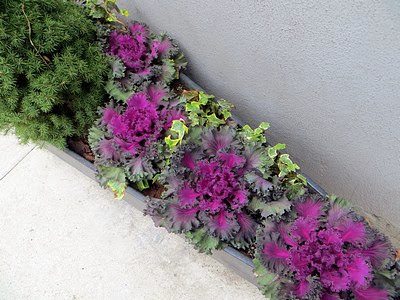 For horticulture buffs, photo 11 shows some colorful ornamental kale along with a small evergreen and something that might be ivy. For steeply inclined street buffs, photo 12 was taken on Joralemon Street between Furman and Hicks, perhaps the only block to live on in Brooklyn if you miss San Francisco. Marshall Chapman does songs from her album Blaze of Glory at Hill Country, New York City. "Think Bo Diddley on acid," Marshall said as she started to strum the familiar "shave-and-a-haircut, two bits" rhythm, then sang about "the difference between falling in love with the way you feel around somebody and falling in love with somebody." 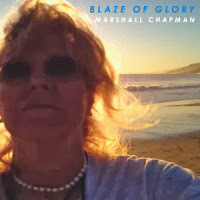 "Blaze of Glory" is an autobiographical song about changes in music, in mores, and in Marshall. Unfortunately, when she calls for a sing-along, you can hear me. I didn't have the song in mind a couple of weeks ago when I took, and titled, this photo, but I will whenever I look at it again. Addendum: I almost forgot to add; Marshall sang her achingly lovely lament for Tim Krekel.